The record-breaking wildfire that has engulfed the city of Fort McMurray in Alberta, Canada, over the past week may yet still double in size, Alberta Premier Rachel Notley said on Friday night, warning that, “in no way is this fire under control.” The Associated Press reports that due to bad weather conditions, including continued high temperatures, dry weather, and high winds, the fire grew on Friday from impacting around 100,000 hectares to more than 156,000 hectares, and another likely two-fold increase in size would encompass additional forested areas, possibly reaching the border of the neighboring province, Saskatchewan, some 90 kilometers east of Fort McMurray. In all, as much as 300,000 hectares (1,100+ square miles) may have either been burned or still be on fire by the end of Saturday. The fire has been so intense, it has even created its own weather at times, complete with lightning that has helped start new fires. The massive fire, now being called “The Beast” by many of the 500 firefighters battling it, is also expected to reach the Suncor oil fields 30 kilometers north of the city, though officials believe the facility will be resistant to the fire because oil sands mines are typically cleared of the vegetation that a wildfire would need for fuel, and because the facility has two accomplished industrial fire departments on site. According to the CBC, at least 80,000 residents have been successfully evacuated from Fort McMurray, where the fire has destroyed at least 1,600 homes and buildings, and where smoke has at times reduced visibility to as little as 10 meters. One piece of good news is that officials reported on Saturday that firefighters have been able to keep the fire away from what’s left of the city for the past two days, and the great news is that due to the high evacuation rate, no deaths or injuries have been reported thus far, which is remarkable considering the harrowingly narrow escapes captured on video and later shared online by fleeing residents. In addition, many evacuees have now had to relocate more than once as previously safe areas have been put at risk by the growing fire and dangerous smoke levels. 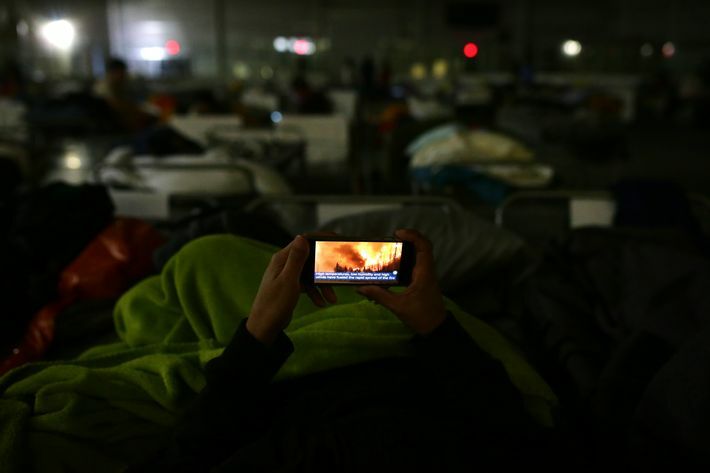 Some $44 million (CAD) has been donated to assist victims of the fire, as many in the country have sought to support those affected. (Donation information can be found here.) 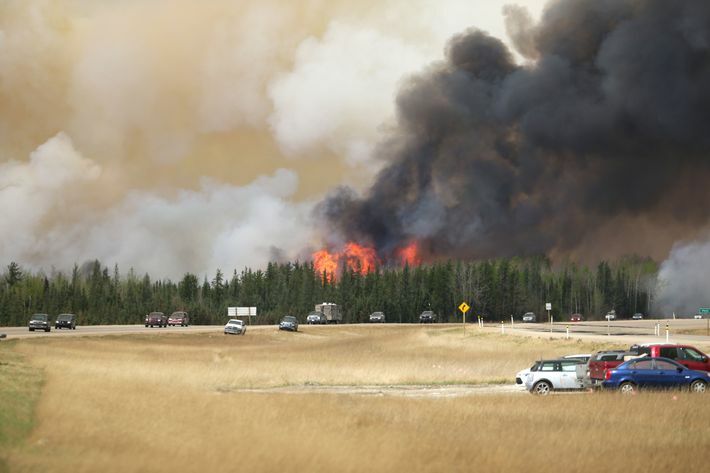 Many of the evacuees have sought refuge by heading to the city of Edmonton in the south, traveling in large convoys past the fire and the many devastated neighborhoods. Economically, the fire and resulting evacuations have led to a 25 percent reduction in the country’s oil production, as oil sands mines in the area have moved their workers to safety and shut down. The ultimate long-term impact on the Canadian economy, which has already been damaged by the low price of oil, remains to be seen. The Alberta oil sands comprise the third largest oil reserve on the planet. Officials now expect the fire to continue being pushed off to the northeast, away from threatened (human) communities and into the wilderness forests. 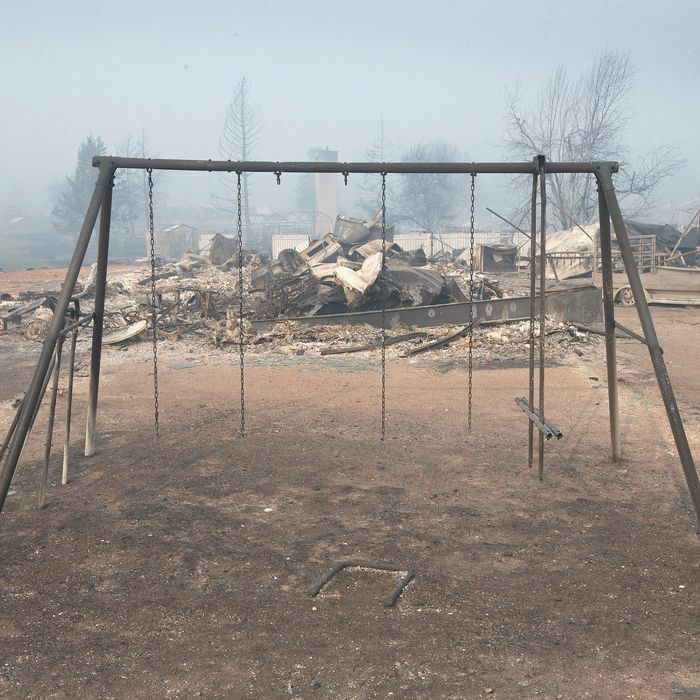 Mike Flannigan, a wildfire researcher at the University of Alberta, told VICE News that if the current damage estimates — in the neighborhood of $8 or 9 billion — turn out to be correct, the fire will have been the most costly natural disaster in Canadian history.